Roberta M. (Clark) Holt, 90, of Belleville, was born on December 27th, 1927, near Melvern, Kansas to Floyd and Ella (Hammond) Clark. Roberta grew up in Topeka, Wichita, and graduated from Elsmore High School in Elsmore, Kansas, in 1946. Roberta married Charles E. Holt on April 21st, 1947, in Chanute, Kansas. To this union two children were born, Eric A. Holt and Robert E. Holt. Roberta and Charles spent their marriage together living in Colorado, Idaho, and then moved to Valley Falls, Kansas in the mid 1990s. Roberta worked as a Medical Office Nurse in various medical clinics through the years. 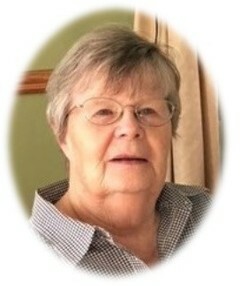 Roberta passed away on August 7th, 2018, in Belleville, Kansas at her residence in the ISB unit of Republic County Hospital. She was preceded in death by her parents, her husband Charles, sisters Betty Price and Dorothy Harp, and brother Don Clark. She is survived by her sons, Eric A. Holt and wife Susan of Calgary, Alberta; Dr. Robert E. Holt and wife Nancy of Belleville. Grandchildren Justin Holt of the US Virgin Islands, Randy Holt (Rob Bauer) of Kansas City, Missouri; Elizabeth Handlovsky (Patrick), Sarah Gyger (David), Lance Holt, Jasmine Pettigrew, all of Calgary, Alberta, Canada. Great Grandchildren Harrison and Jack Holt, Emilia and Alexis Handlovsky, Edison Gyger, and Brooklynn and Kyler Pettigrew, and all of her nieces and nephews of whom she was extremely fond of. Graveside services will be held on Thursday, August 23rd, 2018, at 11:00 a.m., at the Assaria Lutheran Church cemetery in Assaria, Kansas, with Mr. Randy Paugh officiating. In lieu of flowers, the family has asked for memorials to the Republic County Historical Society. Tibbetts-Fischer Funeral Home is entrusted with arrangements.